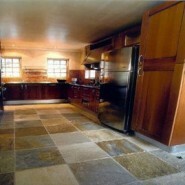 Slate is a wonderful floor for any home. It is rich and warm looking at the same time. It is a tough durable floor and the multiple color variations allow the homeowner to match any décor in a house. When initially installed, most homeowners select to have a seal applied to the slate floors in an effort to make cleaning slate floor easy and simple. Usually this seal is a penetrating type and applied by either the homeowner or professionally. Some residences decide to apply a tradition top coating such as a seal or floor finish (wax). The goal of this discussion is to provide our homeowner readers with a simple and easy way to deep clean when cleaning slate floor. We will also cover the types of tools, supplies and cleaning products required as well as the step by step procedures. Even if a person performs what would be considered a perfect daily or routine cleaning of a floor, eventually soil will penetrate into the pores of the floor and require a deep cleaning. This is true in residential homes as well as commercial buildings. But deep cleaning does not have to be difficult and part of the objective of this article is to advise of the best way of deep cleaning when cleaning slate floor. As outlined in prior articles regarding slate floors, there are two basic types of slate floors; smooth and rough surfaces. Rough surface slate floors can make it slightly more difficult because rough surface slate is what commonly called split slate. In the manufacturing process, a slab of slate is actually split. This creates an interesting and beautiful looking floor but also creates a more difficult surface to clean because it is irregularly shaped and uneven where soil can get deeply imbedded into the uneven shape of the floor surface. We will address what to products to use for cleaning both smooth and split slate floors. Smooth Surface: The “That’s Amazing” Pad from Unichem Marketing, Inc. In one mop bucket mix Cleaner Degreaser with water according to label directions (mop bucket #1). Work Cleaner Degreaser onto floor and grout using the Hoover floor mate or a similar scrubbing machine. For edges and baseboards as well as tight areas, use the following to manually scrub the floor. Using the scrub brush for Rough Surface Slate floors or use The “That’s Amazing” Floor Pad for Smooth Surface Slate Floors. Damp rinse floor with cool clean water (bucket and mop #2). Allow the floor to dry before allowing foot traffic on the floor.